Cruising past some farmland yesterday Jan noticed some new born lambs springing around in the sunshine and immediately commented “ mint sauce!” How cruel……. But accurate! This morning we discussed whether to wind and go back towards Hungerford whilst waiting for water levels to recede, or should we stay on our current rural mooring. At the moment we’re staying! Jan then decided it was time to do some laundry and put Candy to work. We started Waiouru’s engine to recharge the batteries whilst the washing machine was on. When Candy started her spin cycle I almost thought the Beta was fitted with a turbo charger! It’s not that the machine was being used for the first time but rather I’d not previously noticed the noise it makes. 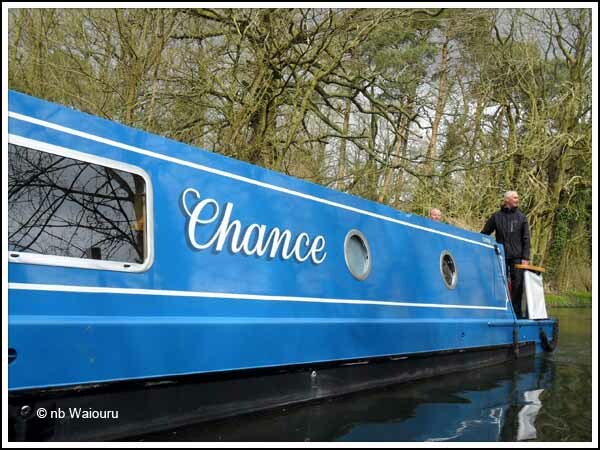 I’d spoken to Doug on nb Chance earlier in the day to check how they were progressing with their passage up the K&A from Reading. Doug informed us their plan was to travel along the K&A to Bath. 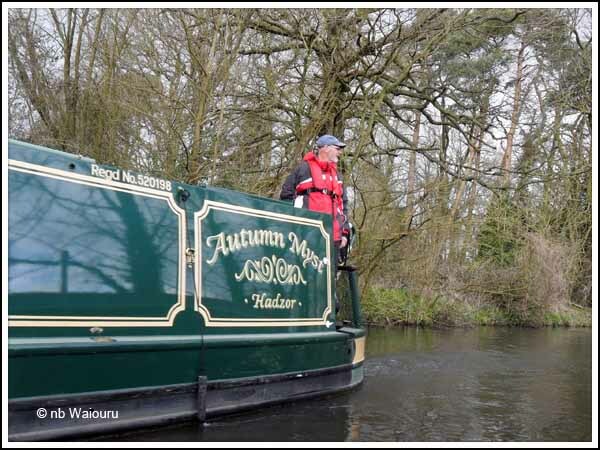 We were able to tell him about our experience coming down through Woolhampton yesterday but they are going upstream and are experienced boaters so they shouldn’t have any problems. At 1.30pm both Chance and Autumn Myst passed and Jan was able to snap a couple of quick photos through the side hatch. Something caught James eye whilst Doug peeks over the roof. Looks like Bob saw the same…… OK… They were both talking to me as I was on the bow when they passed! A lot of old junk! 300 yards and a hell of a bang! Both sides of the coin!